Victoria House offers stunning destination wedding, honeymoon and vow renewal packages thoughtfully designed for your special occasion. Victoria House limits the size of our wedding groups to no more than 20 guests during our High Season (Jan.2 to May 31), and 50 guests during Low Season (Jun.1 to Dec.21), unless the entire property is reserved for the wedding party. Guests must also stay at Victoria House for a minimum number of nights depending on the season. If you would be interested in learning more, or are considering a larger weddings (hotel buyout) please contact our U.S. reservations office. License and Justice of the Peace fees. One tier wedding cake (serves 2-4 people). Services of our on-site wedding planner. Prices start at $1,375 US plus tax; this is additional to the room charges. 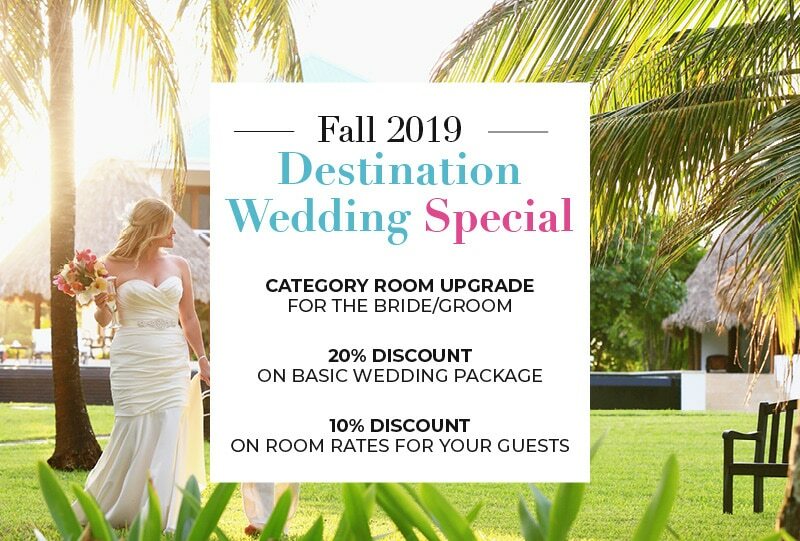 Reserve your Destination Wedding at Victoria House for travel between August 1–Oct 31, 2019 and receive these special bonuses when booking 8 or more rooms.